The Estates are the exclusive development of single homes to the left of the gate house as you enter King's Creek Plantation resort. These homes feature the decor and details expected in luxury vacationing. There's a patio or balcony to experience a cup of coffee in the morning or a glass of wine in the evening. There is one master bedroom and one sleeper sofa. Large whirl pool tub adorn the master bedroom suite. Sleeper sofa is located in the living room. The living room and bedroom have flat screen TV's. There is a washer and dryer, dishwasher, and a full kitchen! The kitchen is fully stocked with appliances, granite counter tops, and an outdoor gas grill. This one bedroom Estate is the perfect getaway for a couples retreat or a small family. This property is just 3 miles from Colonial Williamsburg , 15 minutes away from the Yorktown and Jamestown beaches. Enjoy theme parks (Busch Gardens and Water Country USA), shopping, and dining. There is an onsite restaurant (Seasonal), 3 outdoor pools, 1 indoor pool, fitness center, miniature golf, tennis and basketball courts. You will truly discover a home away from home while vacationing at the Estates! peaceful atmosphere in a safe community. Location, Location, Location! 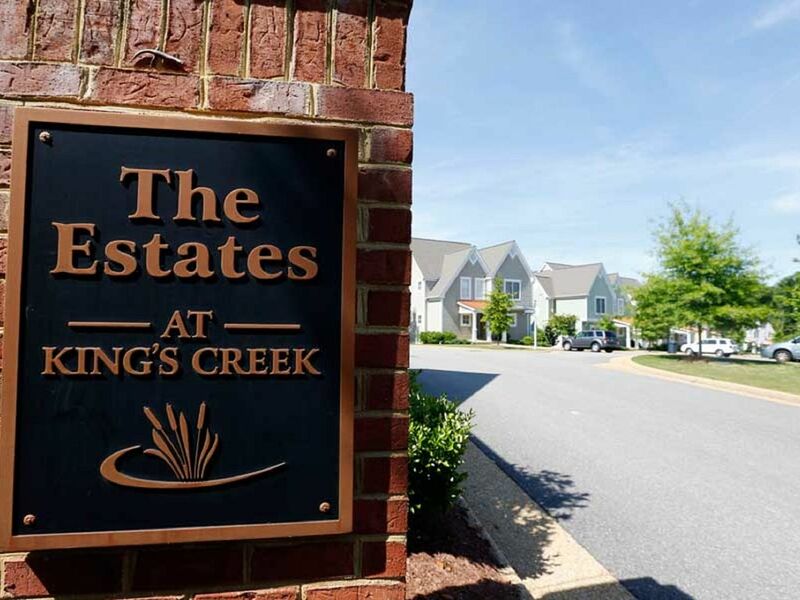 Just minutes away from theme parks, beaches, Colonial Williamsburg, shopping, dining, & more! There is a pocket door that separates the master from the living. Located at the Aquatic Center. The living room has a sleeper sofa, coffee table, lamp, flat screen TV, & DVD player. There is a galley kitchen. You can see the living room from the kitchen. The living and dining room are together. The dining room table seats 3. The dining room and living room are together. There is a dining table that seats 3. Flat screen TV's are in the living room and bedroom. Located in the living room only. You can check out board games from the Activity Center. You can rent DVD's from the Activity Center. Balcony located in an upstairs unit. Patio located in a downstairs unit. On site...Equipment located at the Activity Center. There are three outdoor pools with Hot tubs. There is one indoor heated pool with both an indoor and out door hot tub. These areas are for guest staying at the property only! There are four outdoor hot tubs and one indoor hot tub. There are two playgrounds, miniature golf, horseshoe pit, basketball courts, & fun events at the Activity Center.